Morally vapid. Those are the words that come to mind when analyzing this movie. Producer Todd Phillips and director Nima Nourizadeh's Project X is a wasteland; a vast empty desert prowled by self-destructive teenagers consuming anything and everything that will bring them to the brink of death. Adults who find humor in underage drinking and high school senior anarchy may even get a sick kick out of the mean-spirited madness. Other film fans? If you found some redeeming or comedic value in Project X, by all means, please share it with the rest of the class. Everyone else? Feel free to join the rest of us who have some sense about us. The events portrayed in this film are fictional, and all stunts were performed by actors in controlled environments. No one should attempt to recreate or re-enact any of the scenes, stunts, or general activities portrayed in the film. That's the first and foremost thing everyone who watches this movie should understand. Project X goes to levels even Superbad and The Hangover refused to reach, and does so with complete abandon. High schoolers Costa and J.B. (Oliver Cooper and Jonathan Daniel Brown) aren't as popular as they feel they deserve to be and decide to use their friend Thomas (Thomas Mann) and his birthday as a means to an end. With Thomas' parents heading out of town, Costa and J.B. coax the poor kid into throwing a house party to end all house parties. An ill-advised Craigslist ad, alcohol and hard liquor en masse, drug deals, sexual conquests, criminal unruliness, house wrecking, ecstasy abuse, news coverage, a flame thrower, police intervention, mobilized SWAT teams and... a strong reprimand for the party planners. And -- spoiler alert -- strong reprimand means Thomas is congratulated by his father (yep, you read that right), the boys become ridiculously popular at school, the loves of their lives fawn over them, and the teens are acquitted of all wrong-doing. It isn't just gratuitous high school wish fulfillment, it's wildly indulgent and borderline reprehensible. If teens in this film were likable, funny or worth rooting for in the slightest then this review would have a completely different tone. But aside from Thomas, there isn't a remotely appealing high schooler to be found. Just awful kids destined to become awful adults, partying under the guise of popularity but really just tapping into their basest natures. This isn't teens being irresponsible, it's teens being egomaniacal, barbaric and downright disgraceful. And where's the humor in that? Normally we'd say "one man's junk is another man's treasure" when reviewing a film but sometimes junk is just that. Escapism can be great fun. Think of any raunchy teen cult-favorite: Porky's, Revenge of the Nerds, House Party, Zapped, Fast Times at Ridgemont High, Superbad, even American Pie. Love 'em or hate 'em, they all feature characters that offer something to the audience; something that keeps us glued to the screen no matter what mistakes or misdeeds occur. Project X ignores this whole heartedly, going for increasingly delinquent chaos for no other reason than to see what they can get away with. Naturally the film is now available on Blu-ray which features an extended cut. Project X looks great one minute, gets assaulted by strobe lights another, and gets plunged in darkness the next. Project X is loud, brash and... well, loud. Watching this film via surround not only makes you feel like you're at a house party, it equally makes you want to get away from said house party. Only three brief featurettes are included -- "Pasadena Three," a character overview; "Declassified," a behind-the-scenes rundown; and "Xpensive: Tallying Up the Damages," an overview of the damage left in the wake of the party -- for a grand total of fourteen minutes of high definition extras. Clearly this review was a strong reaction to this no-holds-barred teen comedy, and that's really the best thing to say about it. There is no doubt that someone, somewhere will laugh their head off. Just no one in my social circle. 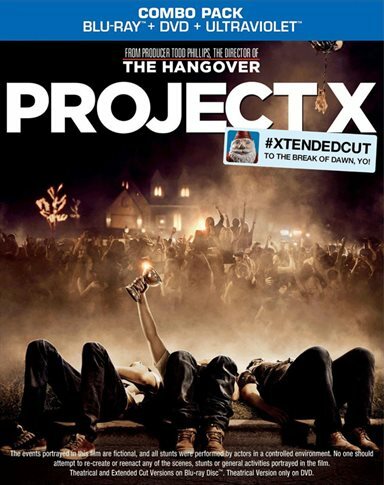 Download Project X from the iTunes Store in Digial HD. For more information about Project X visit the FlickDirect Movie Database.